There are strict rules about how care services are regulated and what should be done when issues arise. In this section you can find out more about the care sector regulator, the Care Quality Commission (CQC) and what you should do if you have a comment or complaint about a service or if you think someone is being abused. All care providers must be registered under a system which brings adult social care, independent healthcare and the NHS under a single set of essential standards of quality and safety. The Care Quality Commission (CQC) registers, inspects and reviews all adult social care and healthcare services in England in the public, private and voluntary sectors. This includes care homes, care homes with nursing, home care agencies and NHS services, amongst others. Inspectors carry out a mixture of announced and unannounced inspections looking at the quality and safety of the care provided. They look at whether the service is: Safe; Effective; Caring; Responsive to people’s needs; and Well-led. Inspection teams are led by an experienced CQC manager and often include experts in their field. The team may also include professional or clinical staff; Experts by Experience; people who use services and carers. Following an inspection, each care home and home care agency is given a report of how it rates against national essential standards of quality and safety. CQC rates services as ‘Outstanding’, ‘Good’, ‘Requires Improvement’ and ‘Inadequate’. The care providers listed on our website include their CQC ratings and links to latest inspection reports. If you use a home care agency or move into a care home or nursing home you should feel able to comment on any aspect of your life which affects your happiness or comfort. This might be anything from the way you are treated by staff to the quality of the food you are served. You should also feel free to make comments and suggestions about possible improvements to your surroundings and the services provided. Making a comment, whether complimentary or a complaint, should not be made difficult for you and should not affect the standard of care that you receive whether in your own home, a care home or care home with nursing. Care services are required to have a simple and easy to use complaints procedure. If you are concerned about the care that you, a friend or a relative are receiving, it makes sense to speak to the manager of the service about your concerns before you take any further action. The problem may be resolved quite easily once they are made aware of it. However, if you need to make a formal complaint, you should initially contact the registered owners of the service. They have a duty to respond to any complaints made. If your complaint is about a breach of regulations, contact your local office of the Care Quality Commission. If your local authority has arranged or contributed to the cost of your service and support, another option is to raise your complaint with your social worker/care manager or the department’s designated complaints manager. If you have been unable to resolve your complaint you can contact the Local Government Ombudsman to assist you. The Local Government Ombudsman looks at complaints about councils and some other authorities and organisations, including Adult Social Care providers (such as care homes and home care providers). It is a free service and its job is to investigate complaints in a fair and independent way. Protecting adults at risk is a priority for all local authorities across England and Wales. It is frequently referred to as ‘safeguarding’ adults. A vulnerable adult is a person aged 18 or over who may be unable to take care of themselves, or protect themselves from harm or from being exploited. This could be someone with a learning disability, a mental health issue, or someone living with dementia. Abuse is mistreatment by any other person or group of people that violates a person’s human and civil rights. It can vary, from treating someone with disrespect in a way which significantly affects the person’s quality of life, to causing actual physical suffering. It could also cover the issues of neglect, including self-neglect, and institutional abuse – where the abuse affects more than one person within an organisation and is not addressed by the service’s management. If you suspect abuse, but you aren’t sure if it is a recognised form of abuse, visit the NHS website which gives detailed descriptions and examples of each type of abuse. The Action on Elder Abuse website may also help with spotting the abuse of an older person, or download our factsheet for more detail about identifying and reporting elder abuse. Abuse can happen anywhere – at home, in a care home or a care home with nursing, a hospital, in the workplace, at a day centre or educational establishment, in supported housing or in the street. 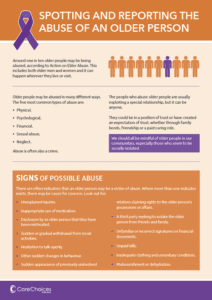 If you think someone is being abused call Adult Social Care. Your concerns will be taken seriously and will receive prompt attention, advice and support. Adult Social Care will also arrange for an advocate to support you if needed. If you believe somebody is at risk of immediate harm, contact the police on 999. Contact the Care Quality Commission (CQC) if the vulnerable adult is living in a registered care home, care home with nursing or receiving home care services. Let a public service professional, such as a social worker, community nurse, GP, probation officer or district nurse know your concerns. They have responsibilities under the county’s adult protection procedure and can advise you about what to do next. There is a barring system for all those intending to work, or are working with children and vulnerable adults. The Criminal Records Bureau (CRB) and the Independent Safeguarding Authority (ISA) merged into the Disclosure and Barring Service (DBS). CRB checks are now called DBS checks. The DBS provides a joined up, seamless service combining the criminal records checking and barring functions. These details will be published on the DBS website. For disclosure information and services, visit the DBS homepage. Care home owners, home care agencies and employment agencies which supply care workers are required to request checks as part of a range of pre-employment checks. Care providers and suppliers of care workers are also required to refer workers to the DBS where, in their view, the individual has been guilty of misconduct. It is an offence for an employer or voluntary organisation knowingly to employ a barred person in a regulated activity role.